Stress and burnout are common among doctors. Excess levels of stress have been shown to have detrimental personal and professional effects as well as a negative influence on patient care. The aim of our pilot study was to assess the levels of burnout among a cohort of interns. 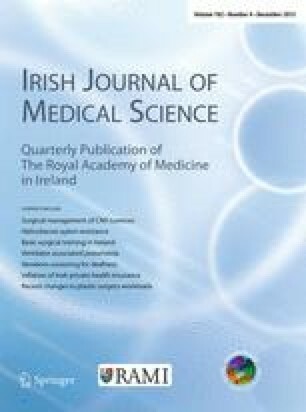 A voluntary written self-assessment of burnout levels was distributed to interns in two teaching hospitals. The Maslach Burnout inventory is a 22-question survey assessing the three components of the burnout syndrome—emotional exhaustion (EE), depersonalisation (DP) and personal achievement (PA). Twenty-seven surveys were distributed to interns in two hospitals with a 96.3 % (n = 26) response rate. The mean age was 25.1 years (range 24–31 years). 14 were medical interns, 12 were surgical interns at the time of completion. Overall, the mean EE score was 23.4 (range 11–29), representing moderate levels of EE. The mean DP score was 9.4 (range 4–14), representing moderate levels of DP. The mean PA score was 18.9 (range 12–29), representing high levels of PA. There were no significant differences noted between levels of EE, DP or PA among male or female interns, medical or surgical interns or those who worked in a peripheral or university hospital. Burnout is reported among interns in our pilot study. Measures need to be taken to heighten awareness of burnout among doctors and to educate physicians regarding self-awareness and personal health.